by Heyne, Paul T., Boettke, Peter J., Prychitko, David L.
Heyne, Paul T., Boettke, Peter J., Prychitko, David L.
'The Economic Way of Thinking' develops the basic principles of micro- and macroeconomic analysis, and employs them as tools rather than ends unto themselves. 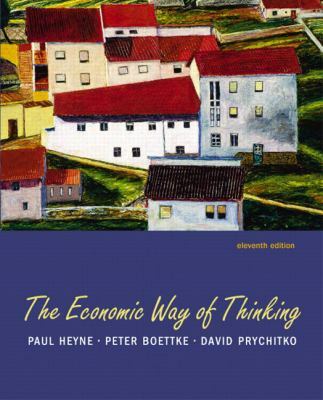 This text introduces students to a method of reasoning; to think like an economist.Heyne, Paul T. is the author of 'Economic Way Of Thinking ', published 2005 under ISBN 9780131543690 and ISBN 0131543695. Loading marketplace prices 13 copies from $8.46 How does the rental process work?